Shaker Family Ford in Watertown, CT, has been in business for more than 50 years and knows a thing or two about running an automotive dealership. They know that technology solutions provide convenience and improve efficiency in day-to-day business operations, and they know that the use of accurate and up-to-date information on the hundreds of new and used cars on the lot is crucial to the success of the operation. Helping Shaker Family Ford to achieve these goals is a Morse Watchmans KeyBank® Auto system complete with KeyPro® software. 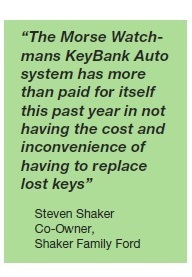 KeyBank is a total management system that tracks and secures keys and helps prevent lost sales from lost keys. 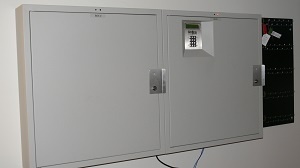 Vehicle keys are attached to SmartKeys™ which are then securely stored in the key cabinets. 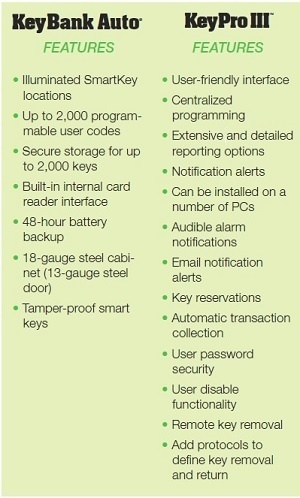 The embedded chip in the SmartKey stores data to help ensure all key usage is automatically recorded and tracked. Now, when management wants to know who last took a car out for a demo, or wants to see the demo history of a specific vehicle, the supervisor need only go to his computer and check using Morse Watchmans KeyPro software for the answer. The system provides the status of every key in the system as well as full accountability for who has or had which key and for which vehicle. And because the system is on the dealership’s network, the information can be accessed in real time by management from their PC, or they can be notified by email when a specific key has been accessed or returned. Along with live access, updating and reporting capabilities enhance the functionality of the KeyBank Auto system. The recorded information can be rolled into standardized databases and spreadsheets for easy manipulation and analysis. At Shaker Family Ford, the dealership management uses activity reports generated by the KeyPro software to help improve operational efficiencies. The accuracy and convenience of the regularly scheduled reports are indispensable for eliminating mystery mileage, vehicle damage and missing keys. Reports are also programmed for specific transactions such as gauging the success of marketing promotions based on demo frequency; determining model popularity; and even reviewing employee sales. system can be reserved for a specified timeframe in order to demo a vehicle for a customer appointment. This feature guarantees that the vehicle key will be available when needed, and it has ended the problem of hiding keys. Keys put into the system can be moved around the facility as the car moves. If a trade-in vehicle goes into the garage for maintenance the vehicles key is placed in the garage key cabinet. Then, when the vehicle comes back to the used car lot, the key is returned to the key cabinet in that location. and convenience of color-coded SmartKeys are even more important. Other system conveniences include large touchscreens on the front panel with large icons and an intuitive interface that offers step by step instructions. Shaker Family Ford’s investment in the Morse Watchmans KeyBank Auto system has provided them with the technology to enhance the sales process and to improve operational efficiencies. Learn more about key control solutions for dealerships.